The BluePrint Cleanse: A Detox with Dessert! This past Saturday, I completed six days on The BluePrint Cleanse, a juice detox program that has seriously captured my heart. If you've spent any amount of time poking around this blog, you've probably already realized that I have a penchant for lush and decadent meals capped off with a bit of sweetness. Because of this, it may surprise you to know that a few times a year (usually around the start of a new season) I like to take a few days off from the indulgence in order to cleanse and refresh my body and digestive system. My favorite is The BluePrint Cleanse, a raw vegan juice cleanse that is prepared fresh and delivered to your door in conveniently numbered bottles. I love it so much, I've already done it three times, and am already plotting my fourth. The night before I started, a delivery man showed up at my door with three cute little cooler bags. Inside each were six numbered bottles containing a selection of three different juices. Since I did the Excavation (or the "strictest") cleanse, the juices were Green Juice (a mix of Apple, Kale, Romaine, Celery, Parsley, Cucumber, and Spinach), Spicy Lemonade (Lemonade made with agave and a hint of cayenne), and Cashew Nut Milk (Cashews, filtered water, vanilla, cinnamon). The juices are meant to be consumed about an hour or two apart in lieu of any other food. It's a somewhat terrifying prospect for someone who loves to eat (and a lot, at that! ), but the truth is that the juices really do keep you sated throughout the day. There were even some times when I had to force the juices down because I was so full. BPC also (wisely) includes a "Cheat Sheet" with acceptable snacks or foods that you can safely incorporate without negating the effect of the cleanse. The cheats are yummy: a 1/4 of an avocado, a few sticks of celery, some warm vegetable broth (I like to kick up that last one by slicing in some garlic and ginger and letting them simmer--it makes for a spicy and satisfying detox soup). They also mention that it's OK to nosh on a few pieces of seaweed, and I found that a handful of kale chips on the first couple days also helped make it easier. The best part of it is that the juices actually taste good! The green juice is sweet with just a little hint of herbal undertones. I actually like to add some lemon juice to it to cut the sweetness a bit. Note that the first time I tried the green juice, I actually *didn't* love it; but with my second and third bottles this went away and now I actually crave it. This seemed to be the case in other reviews that I read so I urge you to give it a chance when you first try it. It helps to pour it over ice and add lots of lemon juice. The spicy lemonade (those of you who have attempted that horrid "Master Cleanse" or "Lemonade Diet" will probably already have an idea of how this tastes) is amazing! The cayenne gives it a little kick (I'm all for heat in my beverages!) and it makes for a great afternoon snack. The final drink, the Cashew milk, is my favorite(!!!). I look forward to this one all day and relish drinking it. It's actually what inspired my homemade pecan milk, because I wanted to be able to cap my evenings off with it all the time. The drink is creamy, sweet, and comforting, with yummy hints of cinnamon and vanilla. For a girl who always orders dessert, I love that the BluePrint Cleanse comes with that extra bit of sweetness! 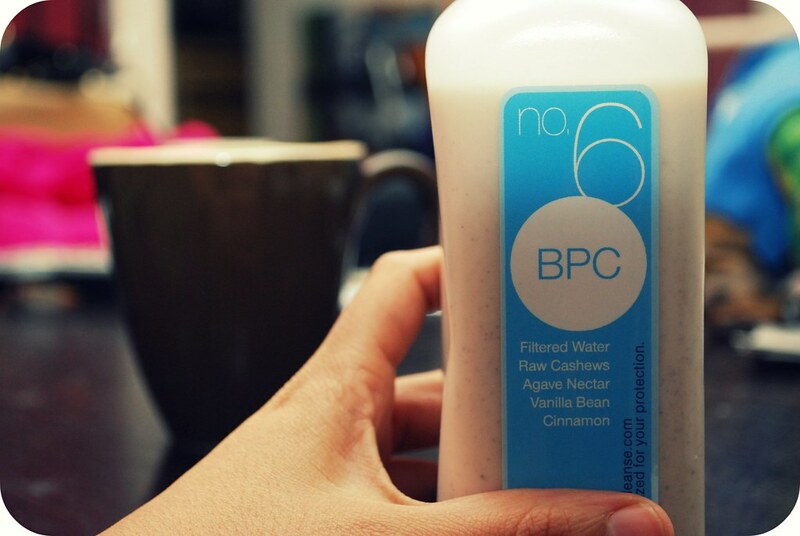 Each time I've done the BPC, I finished off my week feeling refreshed and full of energy. My skin is clear and glow-y, I sleep better, and I drop an average of about 7lbs--most of which is water weight, but which actually stays off! I really look at it as a great way to cleanse my system and get a great head start on eating (slightly) better. In an effort to make this post a little more useful for my readers, I contacted BluePrint to ask them if they would be willing to provide me with a discount code that I can share with all of you, and they happily agreed! If you're planning on ordering a BluePrint Cleanse, I would urge you to use the discount code Goal10 when you place your order. This BluePrint Cleanse discount code is exclusive for readers of Always Order Dessert and will save you 10% on the cost of the detox. Note that it's only available to the first 50 readers who use it, so please be sure to take advantage of it soon. I'd love to hear from my readers who have tried BluePrint Cleanse or who decide to give it a shot. Leave me a comment with your questions or thoughts about the cleanse. Or send me an e-mail. I hope you guys enjoy!! i've heard about it but never tried it due to the cost... have you just done one day or do you usually do it for longer? Hi! I've done this cleanse too, and seriously love it! I plan to do it again this spring. I also love desserts so yes, it is a great way to get the sugar out of my system without suffering. The cashew nut milk is awesome, I would drink it everyday if it were in the store! thank you so much for taking the time to share your thoughts on this! i have been seriously considering the Master Cleanse, but am kinda scared of it. i may just try this one instead - seems much more enjoyable! How many days do you normally do this for? I've been looking for a good cleanse but the idea of doing another "Master Cleanse" (of the lemon juice and cayenne pepper variety) has me running for the door. Shannon: I've done it twice for 3 days and once for 6 days. Honestly I think it's worth it to splurge for at least 2 days and then follow the pre & post cleanse schedule to the letter (slowly eliminating meats and dairy for the 3 days prior and 3 days after). I know it's pricey, but I felt so good afterward that it was really worth it to me. Plus you can consider all the money you're saving on other food, drinks, cocktails,etc, and it actually works out well. Another option, if you have a juicer, is to follow the same plan with homemade juices! It takes a little time, but you'll save some cash and still reap the benefits. Kelsey: I love the cashew milk! If you check out my Pecan milk recipe, it's actually really similar and you can also use the same recipe with cashews to recreate it at home. It's so good! Chanelle: I definitely recommend it. I wanted to try the Master Cleanse too, but I just had zero will pwoer to get through more than a day on it. This one worked because of the variety, and the fact that it actually provides nutrients and sufficient calories (about a 1000) to get through the day. It's much healthier and really effective. Melanie: I've done it twice for 3 days and once for 6 days. But note that you also have to prep for 2-3 days before and after by eliminating dairy, meat, etc in order to ease into it. All said and done, it's usually about a week-long commitment but can Be longer if you'd like. Your pictures are so pretty! How do you get the filter and the rounded corners? The thought of not eating seriously scares me, but what I have put in my body scares me more i think (overindulgent)! I'm going to give this cleanse a try, thanks for sharing this info! I'm starting a 3 day BPC on the 26!! Wish me luck! Sorry to rain on your parade but I tried the cleanse this past weekend and I just could not do it. I wasn't hungry at all but the juices are so seriously revolting it took me half an hour to go through them retching all the time. Actually this happened only with the green drink (and this from somebody who likes green juices in general). The one that everyone one seems to find delicious (the cashew milk) is even worse, I could only manage a sip before giving up. What floors me it that most (but not all) people that tried the cleanse and who write about it on the web say they liked it but most people I know in real life took a whiff and pronounced me crazy for even trying. On a more positive note, the lemonade and the fruit juice are very good. If I were in the States I would def give it a try!.